The new Strapped Fit Cal Odyssey custom printed everyday sock is the most comfortable sock in the world! Sweat Wicking Select Terry pads coupled with patented Heel Strap offer a secure and cushioned fit. 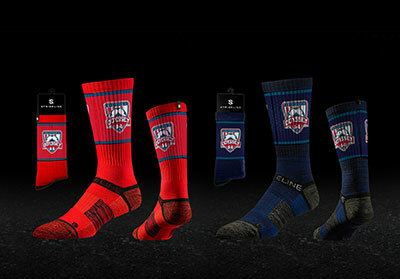 These incredibly comfortable socks with the awesome graphics come in red or blue Odyssey colors. One size fits (almost) all. For shoe sizes 5 up to adult. While supplies last!. The promotion period will end when the last pair of socks are sold. Place your order below by clicking PayPal Buy Now button. The Odyssey office will contact you and let you know when your socks are ready for pickup. You will pick up your order at the Odyssey office.